Dr. Lakisha Simmons at Belmont University in Nashville, Tenn. November 4, 2016. Need some help organizing all the post-midterm homework and semester-long projects? There’s an app for that. 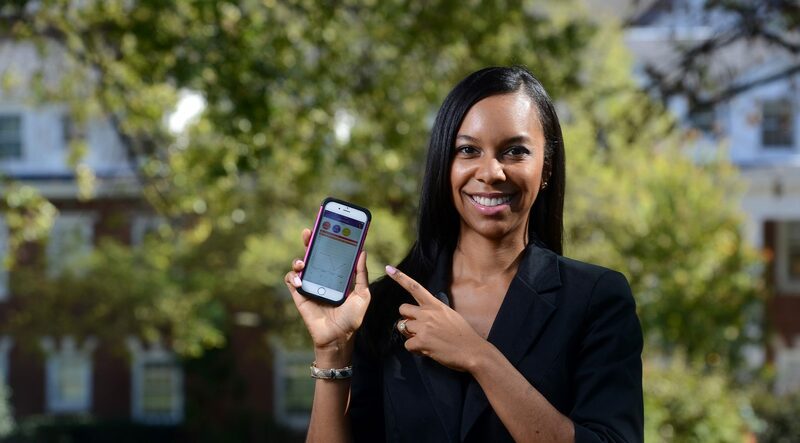 This time, there’s a Belmont professor making the app possible and potentially easing students’ stress in the process. Dr.Lakisha Simmons, assistant professor of management information systems in the Massey College of Business, and her colleague Dr. Chris Simmons (Lipscomb University professor of computer science and software engineering) collaborated on the creation of the Homework Suite Student Planner, an academic planner mobile app that went live earlier this fall. The app was designed with college students in mind as the couple sought to create solutions to the “I forgot” problem and to help students track their own class attendance and keep tabs on group projects. In fact, college students can import syllabi assignments directly into the app (see the import section on the website), alleviating the need to enter individual assignments for each class into personal calendar software. Display an assignment feed and calendar view to quickly see what tasks are due and when. Provide a useful dashboard to visualize what’s due today and how much is due over the next several weeks. Accept a picture of a handout or notes from an instructor and add it to the notes of a task. Homework Suite is free and can be accessed via Google Play, the App Store and on the website. A ProStudent upgrade is also available as an in-app purchase of $2.99 that offers additional resources.